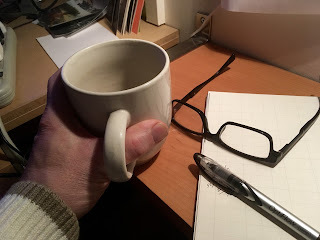 In the wee small hours of the morning, as I grip my first cup of coffee, I like to write. While I do it a lot less frequently than I once did, writing a blog post, for me, is a great way to start the day. In a way, it is a gut check as to what is on my mind, what lies ahead, or what happened the day before. I generally allow the topic to wash over me, to reveal itself in the exhalation of a slow breath. It's 2017. How did that happen? My 50th year. The years are now marked by the signature applied to my paintings: 2014, 2015, and 2016 are gone. I did the math yesterday; 2016 was painted on canvas 242 times, or an average of 4.5 paintings a week for an entire year. It may seem like I'm always super motivated, inspired and tireless to produce that much work. It is not the case. There are days when it takes everything I have to go out in the studio and start the next project. However, I've become rather disciplined about moving forward every day. I've learned to trust that everything that gets put in my path is there for a reason, to teach me something. Every parade, traffic jam, pothole, hazard and blind curve serves to help me grow as a person, husband, father and artist. There is no end to the evolution. 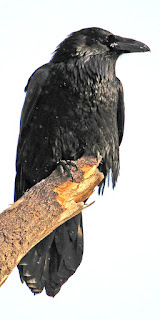 For most of my life, ravens were a blot on the landscape, annoyances nibbling into bags of garbage heaped on the side of the road. There was a shift this fall about these feathered friends; all of a sudden I stopped and paid attention to them. I've had several remarkable conversations with them, always when they are on the own - if there is more than one they completely ignore me. I keep hearing new and marvellous sounds as we exchange ideas. It makes me wonder what other wonders I've missed along the way. I want to miss less this year. I have been amazed how the universe provides answers to questions, spoken and unspoken. I'm listening better in my older age, trusting the messages that come my way and acting on them. I'm living less in my head and more in my heart and body. I started my eating program in mid-December, and despite several days of tasty temptations and over indulgences, I am closing in on the 10-pounds-lost marker. My body was sending me signals, particularly in the area of my lower back, that a shift needed to happen. I'm feeling better in every way and fully intend to continue until I hit my target weight and beyond. Approaching 50, I need to honour and protect this vessel that I've been given, so it can serve me for 50 more years. It's almost 8 am; time to go out to the studio, listen to the wind, say hello to the ravens, and move forward. Have yourself a great day.